You know that I am in the refitting process of my King´s Cruiser 33 sailing boat and with it comes the delicious task of refurbishing the head. Well, I don´t want to talk about my own boat here in length but you are invited to see my proceedings here by reading parts 1 and 2 of the head-refit. But, anyways, everything starts with the toilet. In my case, it was an old and not-so-nice used bowl which I surely took out (and replaced it by a brand new Jabsco pumping toilet). This is how I started on my own boat. An old pumping WC. I am writing this blog post because I recently go so very excited about the fact that I truly discovered the benefits of the electric toilet aboard a sailing yacht that I want to share my passion. 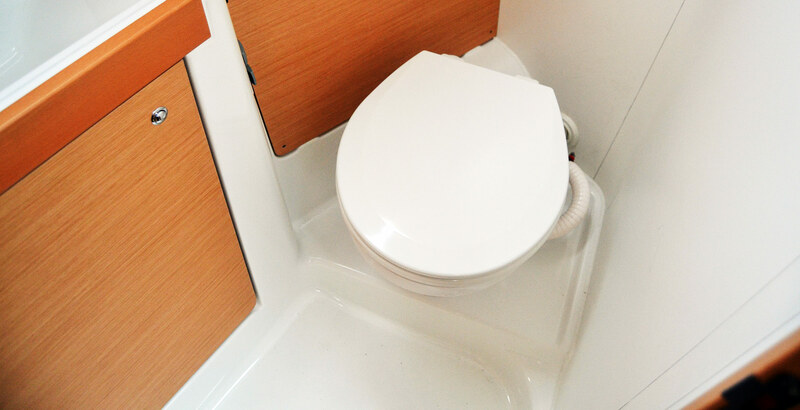 During the inshore delivery process of a brand new Beneteau Oceanis I had the time to enjoy the convenience of a Jabsco Quiet Flush-system that I do have this one advice for you sailors: Please, for god´s sake, opt for the electric WC! Why? You might shout out, that´s a matter of fact for me! Well, if that´s the case, I salute you, Sir. Because I was one of the “old salts” always stating that electric stuff aboard a sailing yacht should be taken to the minimum possible. Because “what can break down will break down” and electric things are prone to breakdowns. Well, that might be true, sure. But believe me, there is absolutely no reason to ban an electric WC from your (new) boat! Let´s talk humans first. Well, relieving oneself is not the most favoured occupations of us all, especially when it comes to taking a dumb. So, I would say, everything that makes it more comfortable, cleaner, faster and convenient has a definitive Go! from my side. 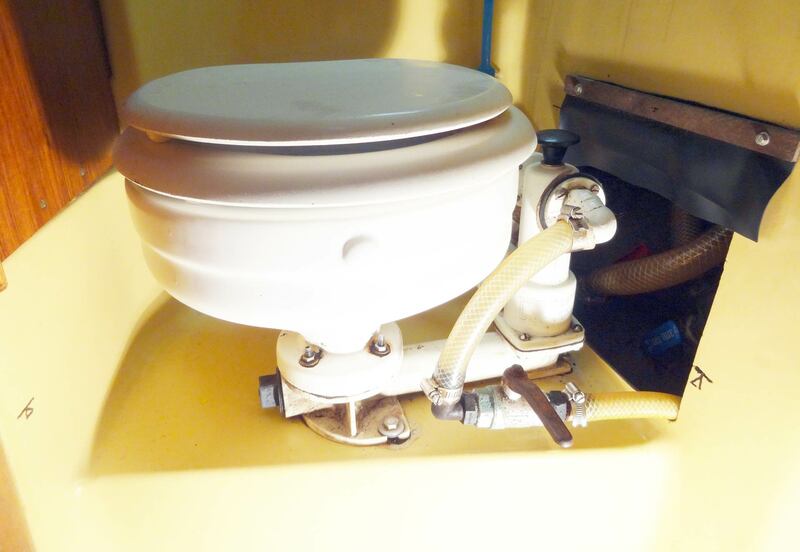 Utilizing a pumping toilet is … at least for first timers and especially fellow guests aboard an adventure of it´s own. I personally love those moments when your guest sticks out the (glowing red) head of the head and completely forgot when to push the switch, when to pump and when to open or close valves. I would say that we are all weary of this procedure. Three functions on two buttons: Easy! The nice thing about an electric toilet is, that it is just pushing buttons: One for sucking and mincing the stuff and putting it away (into the waste tank) and one for flushing. That´s all. Even five year old children won´t get confused or embarrassed. It´s as easy as ABC! Second thing is that there isn´t any bad odours. I have the feeling that pumping toilets will inevitably start to get smelly one day or the other, no matter how you treat them. Yes, they are comparably cheap with starting prices as low as 99 Euros, but do you really like changing toilet-systems every three, five or eight years? The price of the complete Jabsco Quiet Flush-system is around 1.300 Euros (with the toilet itself coming in at some 450 Euros). That sounds like a big thing but I promise it will pay off: You will be delighted of the fact how easy and untroubling the run down below deck will become. You guests will love it and, honestly (I know it´s a cliché but it´s damn right) your sailing wives will reward you for this investment. 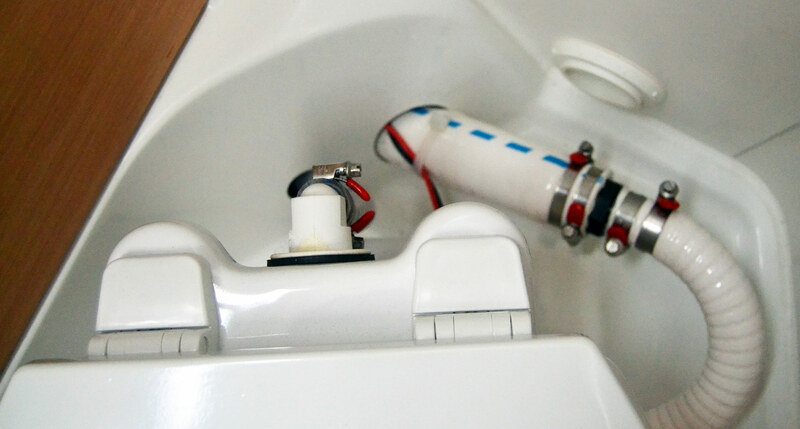 Modern electric systems come with the toilet seat which is not very different in weight or in size from their mechanical counterparts. Behind the blinds another strong pump is necessary that will provide the system with water for the flushing and mincing process. It´s all not that complicated and the installation which I´ve seen multiple times in the yard isn´t rocket science at all. Once installed, yes, you always need electric power from the batteries in order to be able to keep it working. Purists may argue that in a case of total loss of electric power the toilet won´t be working but, honestly, in case of total loss of electric power there are far worse things like losing GPS-signal, plotter and instruments for navigation than taking a dump. So here´s my advice: If you think of buying a new boat, be sure that the main head will be equipped with a quiet flush electric WC. Tinfoil hats may then have the secondary head with the mechanical counterpart. And as strongly I´d like to have one of these in my own boat too, I won´t have it. But the next one, promised!, will have one! Just an addition to the fresh water flush suggestion – folks should be aware that toilet manufacturers have specific designs and requirements for safe fresh water flushing recommendations, as bacteria migration/contamination of freshwater tank is a serious concern. For many boats, if stinky marine organism from salt flush is a real problem (say if the boat is being put away or the toilet isn’t used very often) – just fill the bowl with the shower and pump the freshwater thru. Thanks for an interesting article!! How are the noise levels compared to manual pump toilets? The electrical toilets are often marketed as “silent”, “quiet”, etc which indicates that these things can be quite noisy. I am considering an electric toilet but if hell breaks loose when the button is pushed it would be a show stopper for me. well, the pump is not louder than the fresh-water pump you may have already installed. The “mincer” is not loud either. You can hear it, definitely, but it is not louder than pumping sound generated by a manual WC. I would as well assume that the duration of the sound is much shorter because the electric system works much faster. Try to watch some YouTube Videos to get a feel? But there won´t definitely break hell lose, it´s really not like this.